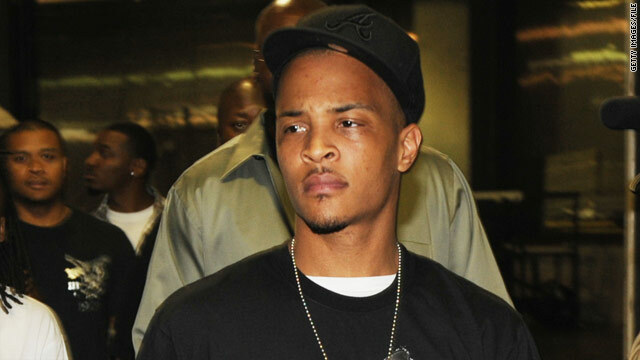 Rapper T.I.., shown here at his final countdown concert, was released from prison on Tuesday. (CNN) -- Rapper T.I. was released from prison on Tuesday after seven months, his attorney confirmed. The performer, whose real name is Clifford Harris Jr., will serve the remainder of a reduced sentence in a correctional center near Fulton County Airport in Atlanta, Georgia. Harris was sentenced to a year and a day in March 2009 resulting from weapons charges related to purchasing machine guns and silencers. Officials charged him with providing a bodyguard with $12,000 to buy weapons. In May, he reported to a federal prison complex in Forrest City, Arkansas, to begin serving his sentence. In addition to serving prison time, T.I. was placed on house arrest, given community service and was ordered to pay a $100,300 fine. It was not the first time the platinum-selling artist had been in trouble with the law. Harris was not permitted to own any guns because he had been convicted in 1998 on felony drug charges, possession of crack cocaine with intent to distribute, in Cobb County in suburban Atlanta. After the rapper's arrest, he entered a plea agreement, which federal authorities called unique because it allowed him to remain out of prison for a year while he performed. Steve Sadow, Harris' attorney, said prisoners with Harris' sentence are eligible for a 54-day sentence reduction for good behavior. Harris is expected to remain at the halfway house for three months and will still be required to finish serving slightly less than 500 hours of community service and about 23 days of home incarceration. Before reporting to prison, Harris threw himself a going-away party/concert attended by thousands at Philips Arena in Atlanta.